The College of Veterinary Medicine educates leaders in veterinary medicine and biomedical research in its D.V.M., post-D.V.M., and Ph.D. programs, who in turn advance knowledge at the interface of discovery and application. As the only medical college on Cornell’s Ithaca campus, the College of Veterinary Medicine is the center of biomedical research and teaching within a world-renowned research university, enhancing the scientific training and broad exposure of our students. The College takes pride in its rich tradition as an innovator in veterinary education, animal disease discovery, clinical medicine, and biomedical research. Ongoing curricular evaluation and modification have produced a balanced D.V.M. 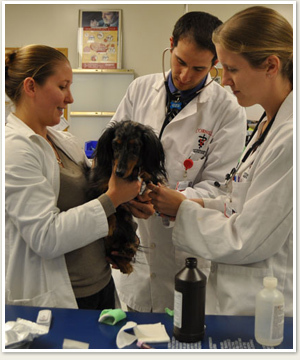 teaching program that includes didactic and problem-based elements, promotes the early exposure of students to animals and the development of clinical skills, provides the opportunity for specialization within a framework of core knowledge expectations, promotes significant research exposure, and integrates preclinical and clinical information. The Cornell University Hospital for Animals combines large animal, companion animal, and exotics training in one location, treating approximately 19,000 animals per year, primarily complex medical cases referred by veterinarians throughout the United States. The Section of Ambulatory Medicine treats an additional 38,000 animals in Central New York over the course of 3,000 annual farm visits. Students benefit from exposure to outstanding Centers and Institutes, such as the Animal Health Diagnostic Center, the Baker Institute for Animal Health, the Vertebrate Genomics Center, the Companion Animal Health Resource Center, and the Feline Health Center, and can take advantage of summer opportunities including the Expanding Horizons Program, and the Leadership and Veterinary Investigator research programs. Finally, the College’s D.V.M./Ph.D., GRA, and Clinical Fellowship programs seek to foster the development of future leaders of academic medicine. Through its broad programmatic strengths in education, research, and clinical and diagnostic medicine, the College of Veterinary Medicine produces highly competent D.V.M. graduates and post-D.V.M. trainees, while inspiring many to advance and shape the profession’s future.